While England's first railway lines were laid in the mid-1820s, it was not until the 1840s that they began to extend beyond the major industrial centres of London, Manchester and Birmingham. Safety was a big concern for both passengers and railway companies. Indeed, some trains had separate carriages for women, in the conviction that this would make it safer for them to travel alone. 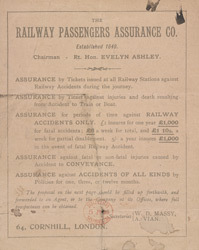 Bodies such as the Railway Passengers Assurance Company offered compensatory policies to commuters in the event that their journey was disrupted by accidents, fires or loss of luggage. Despite the company's rail-oriented name, it offered standard household and travel insurance as well.